We finished Katherine Applegate’s, beautifully crafted piece of fiction, The One and Only Ivan. What I wondered, amid the clapping and what-are-we-gonna-read-next questions was, what did my students walk away thinking about this story. Were they thinking? My plan was to read Ivan the Remarkable True Story of the Shopping Mall Gorilla as a follow-up. My kiddos were aware that a real gorilla named Ivan lived in a mall, but they didn’t know many details. I started the True Story by asking students to notice the facts that appear in Applegate’s One and Only Ivan. We agreed that the actual story of Ivan was a good one. Why I wondered aloud, did Applegate decide to invent these other characters for The One and Only Ivan? I invited students to pick one or two of the fictional characters, and wonder, what purpose does this character serve? Why did Applegate invent this character for us? “Ummm, that’s a possibility. He could serve other purposes too,” I say, trying to keep students open to other possibilities. Students got their post-its and started jotting. The biggest stack was about Bob. Yep, he was the wise guy. In more ways than one. Many thought he supported Ivan and understood him. Often speaking wise words. The few I share below are representative of other characters. Maybe the author want people can change the world and help animals in the world too. 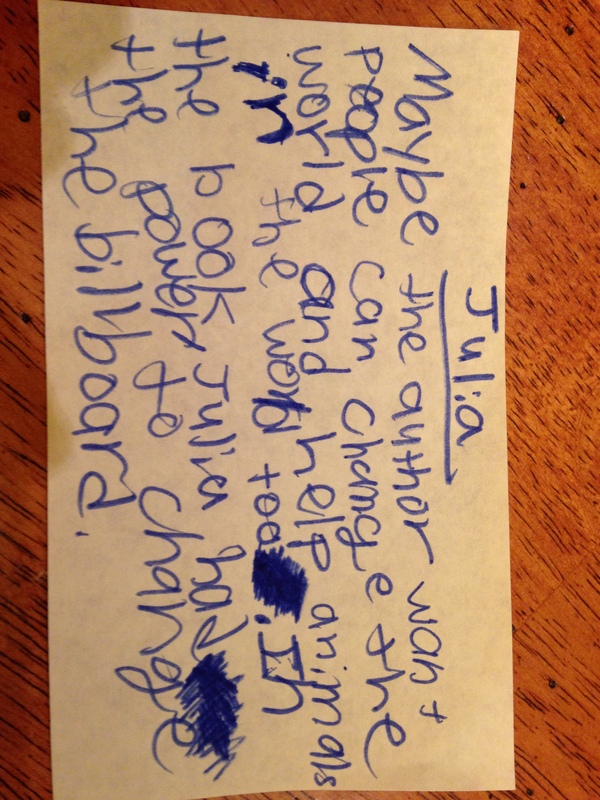 In the book, Julia had the power to change the billboard. 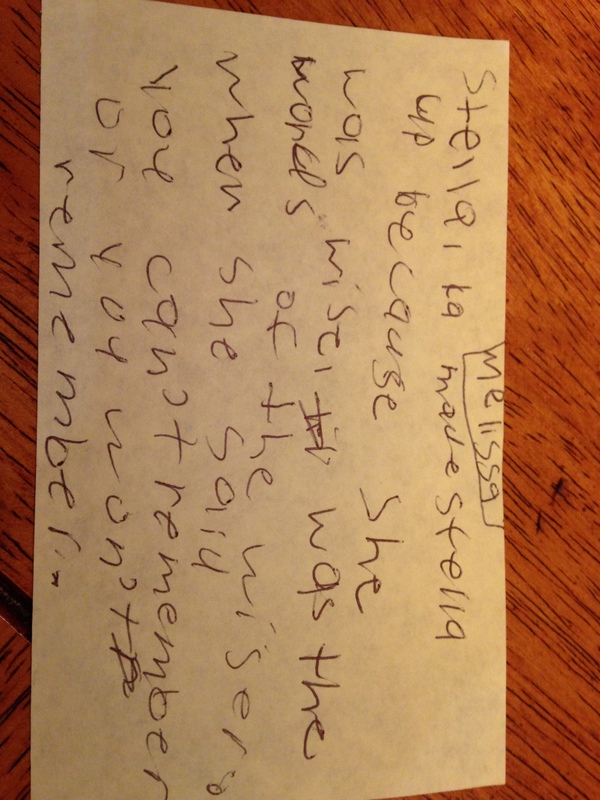 KA made Stella up because she was wise, the words of the wiser when she said, you can’t remember, or you won’t remember. I think that Ruby is in the story for many reasons, but I think the main one is to show how Ivan made a difference with a promise and his leadership as a silverback. 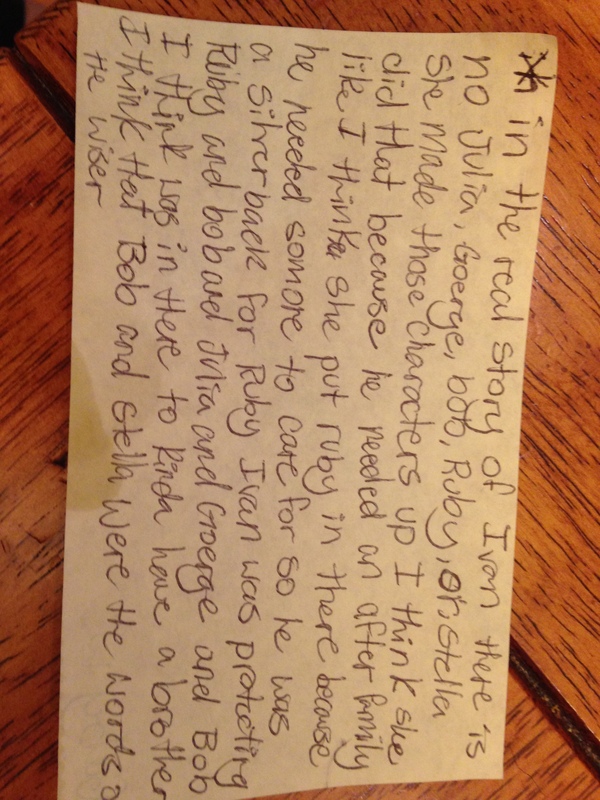 In the real story of Ivan, there is no Julia, George, Bob, Ruby, or Stella. She made the characters up. I think she did that because he needed an after family like I think she put Ruby in there because he needed someone to care for so he was a silverback for Ruby. Ivan was protected Ruby and Bob and Julia and George. Bob I think was in there to kinda have a brother. I think that Bob and Stella were words of the wiser. Lots of thinking here. Connecting pieces of the story and to the world. A three minute quick jot showed a lot. The beauty of having an informational text to place alongside Ivan was in the comparison. This exercise was logical in its push to consider the author’s intent, character traits, and theme issues. While we can’t put all fiction next to informational text in this way, the idea is transferable. Knowing that authors intend, we must ask ourselves, why did the author invent this character, situation, choice. Each character is there for a reason; it’s our job to figure it out! The practice of writing begets more writing, but also feedback, and a wealth of mentor texts feed writers. Reading your slices informs and inspires me. Thank you, Two Writing Teachers for this place to show up and try things out. 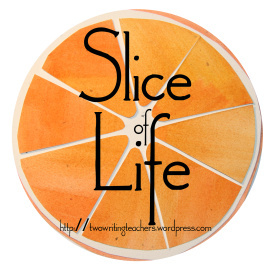 Click here for more slices. Thank you for the great idea! I am also reading The One and Only Ivan to my class and we are nearing the end. They LOVE it and I also have the nonfiction book that accompanies it and was planning on reading it to them after we finish the book. I love the idea of asking students the purpose those characters served in Ivan’s story and I think I will try it with my class too! Your students were really insightful. Do you have another book selected for your next read aloud? I read The Miraculous Journey of Edward Tulane in the fall and they LOVED it and Ivan, too. I need another great book for them to fall in love with! Suggestions? I planning the Long Walk to Water next. This is such a powerful story. Two voices, two different times that meet up in the end. Very different than Ivan but a worth read aloud. Loved that. Loved seeing your kids’ thinking. Thank you for sharing. What a wonderful discussion for your students to help them grow their thinking. Great thinking here. 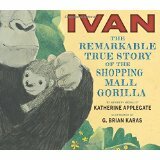 I have The One and Only Ivan but haven’t bought the nonfiction picture book yet. You have given me reason to do so. I led my students to find research about the real Ivan. I love your idea of questioning author’s purpose. Thanks! This is wonderful work, Julieanne. We’re doing this, a bit, with historical fiction – asking the same questions with regard to the author’s intention and larger message. 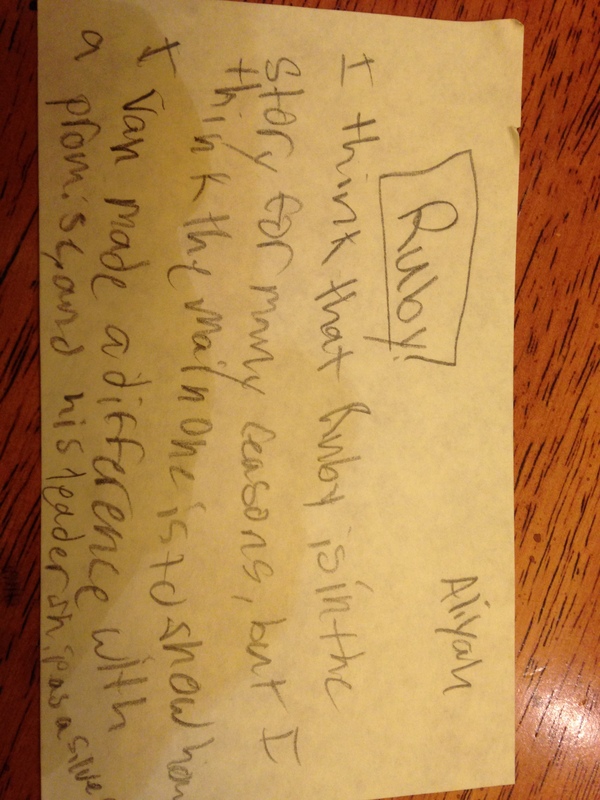 Thanks for sharing your kids’ thinking, too. This is delightful. Somewhere buried in storage is a box full of such treasures from when my boys were young. Thanks for sharing a piece of your children’s minds with us. This is great. I will think about other comparisons I could make in books Julieanne. Even if the book is not the exact story, might there be other books stories that are near a true story? I’ve been doing some lessons about different grammar, writing craft rules/processes, and even with my very old students, they seem surprised that authors might spend a lot of time making a complex sentence just the way they want. Spending time discussing author intent can be applied often. Love the words of the students! I love pairing text, and I love to see the thinking of your students in this pairing. This is such powerful work. What an authentic pairing of texts and connecting to larger life issues and concepts. Love the post it’s by your reader, thinker, writers! This is such a smart idea, Julieanne, and your students insights are impressive. I’ll be sharing with teachers and thinking of other possible pairings. Thanks so much for sharing! I love reading your students’ work! This was such a good idea to get them interacting with the text and thinking about it in really meaningful ways.Love it!